On 1st September 2016, the management of the former Cheadle Hulme Recreation Centre was transferred to Cheadle Hulme High School (CHHS) and, after extensive refurbishment, Club Cheadle Hulme was launched in November. Club Cheadle Hulme has invested £1 million in the building to provide an exciting new fitness experience, which incorporates a brand new gym utilising the latest technology and equipment. We also have a state of the art floodlit 3G full-size pitch for football and rugby, as well as a smaller astro-turf pitch and refurbished tennis courts. Our team of qualified staff here at Club Cheadle Hulme offer their guests excellent sport and leisure opportunities and we aim to continue to improve our facilities in the future. Rob began his career at Stockport County Football Club in 2000, having progressed through the Centre of Excellence youth system to make his debut as a substitute defender at Fulham. He spent one season at Blackpool in 2004/05, before re-joining Stockport where he remained until 2008. In August 2004, Rob received a call-up to the England Under-21 squad as a substitute for their friendly against Ukraine; he played for and captained the England under-19 team. During the 2006/07 season, Rob was part of the Stockport County side that set a record for winning nine games in a row without conceding, notable for playing every minute of the nine-game run. In June 2008, Rob was released from his contract with Stockport County after an injury-plagued year, which forced him to retire prematurely at the age of 25. He went on to pursue his referee and coaching qualifications and in July 2010, became Stockport County’s Commercial Manager. Rob joined Life Leisure in 2013, responsible for generating new business at Stockport Sports Village, going on in 2015 to become Football and Membership Sales Manager, generating income at three sites through football pitch hire and membership sales. 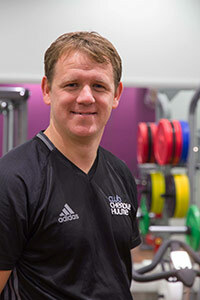 Rob was appointed Sports Centre Director at The Laurus Trust’s Club Cheadle Hulme in September 2016. He has overall operational responsibility for developing the sports facilities, quality control and planning and delivering future projects.